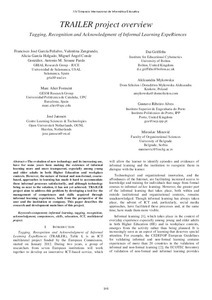 García-Peñalvo, F.J.; Zangrando, V.; Garcia-Holgado, A.; Conde , M.; Seoane, A.; Alier, M.; Janssen, J.; Griffiths, D.; Mykowska, A.; Ribeiro, G.; Minovic, M.
The evolution of new technology and its increasing use, have for some years been making the existence of informal learning more and more transparent, especially among young and older adults in both Higher Education and workplace contexts. However, the nature of formal and non-formal, coursebased, approaches to learning has made it hard to accommodate these informal processes satisfactorily, and although technology bring us near to the solution, it has not yet achieved. TRAILER project aims to address this problem by developing a tool for the management of competences and skills acquired through informal learning experiences, both from the perspective of the user and the institution or company. This paper describes the research and development main lines of this project. García, F.J. [et al.]. TRAILER project overview: tagging, recognition and acknowledgment of informal learning experiences. A: Simposio Internacional de Informática Educativa. "SIIE 2012: Actas del XIV Simposio Internacional de Informática Educativa: Andorra la Vella, Andorra: 29 al 31 de Octubre de 2012". Andorra La Vella: Enginyeria i Arquitectura La Salle. Universitat Ramon Llull (URL), 2012, p. 315-320.